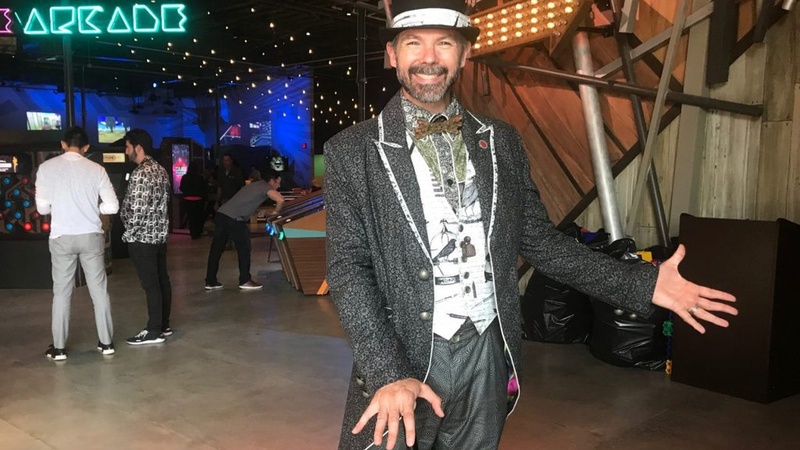 Brent Bushnell, co-creator of the Two Bit Circus Micro-Amusement Park, welcomes people to its new permanent space in the Arts District. Photo by Frances Anderton. 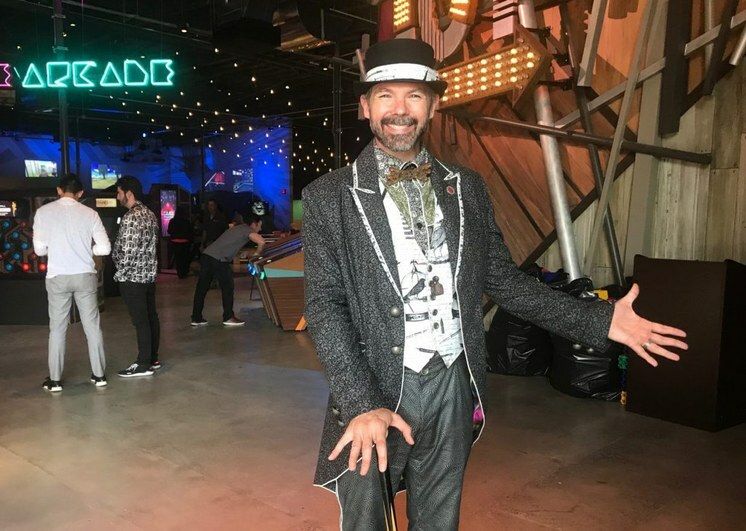 This new interactive and immersive complex, occupying 50,000 square feet in a former warehouse on Mateo Street in the Arts District, was co-created by Brent Bushnell and Eric Gradman. 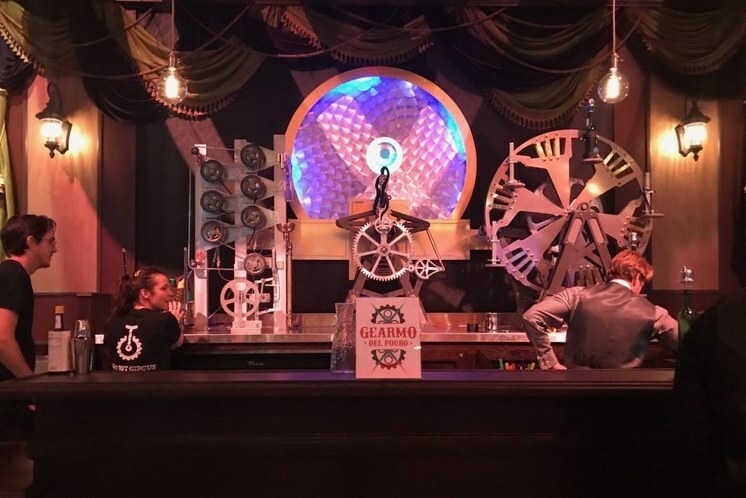 From this came a series of nonprofit STEAM carnivals aimed at children -- STEAM being where STEM (Science, Technology, Engineering and Math) meets Art + Design. Now they have launched the for-profit “Two Bit Circus” with the goal of expanding globally. As its name suggests, this is not a circus in the traditional sense. You won’t find animals or acrobats, though there were folks on stilts at the preview. Rather, this “park” is a 21st century mash-up of virtual, mixed reality and group play, escape/story rooms, dining and bar areas and more, spread through different zones. On entering you see a circular bar, and to its left the Midway arcade, filled with updated version of Coney Island-style classics like the “Demolition Zone.” That’s where two players swing a hanging leather “wrecking” ball at a virtual building to see who can cause the most damage. Great for getting rid of pent-up frustrations. Guillermo del Pouro is a steampunk-inspired robot who is designed to mix drinks, with some human assistance. Photo by Frances Anderton. Behind the Midway is Guillermo del Pouro, where a robot mixologist will preside. Entered off of the space is a hundred-seat theater, for games shows and other events. 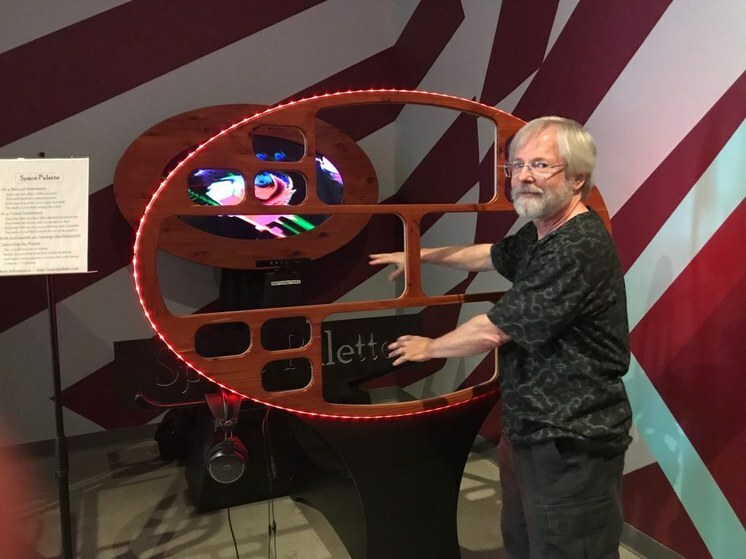 Although one of the attractions is a hologram selfie -- where you watch yourself in hologram form reach for coins, and then the image is sent to your phone -- the experience differs from the selfie museums that have proliferated recently, in being focused on games and the fusion of artistry and tech. Andrea Ruffalo greets visitors with a traditional circus style “Step right up!” Photo by Frances Anderton. 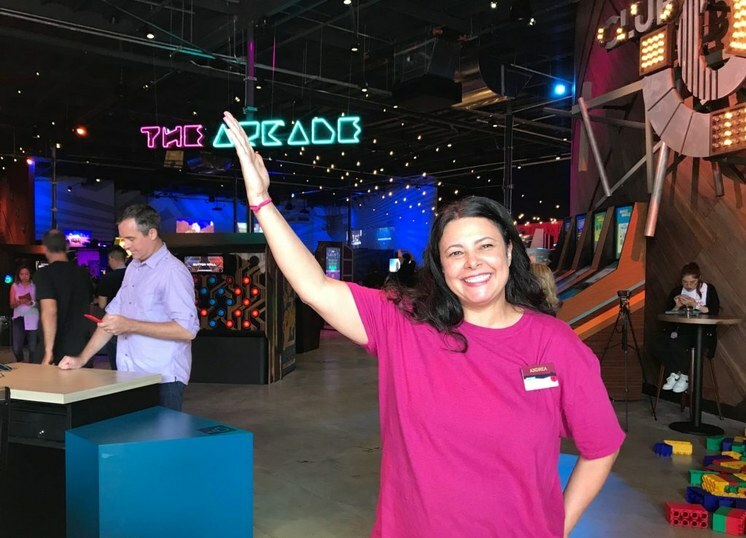 On arriving, a greeter named Andrea Ruffalo, above, recommended that DnA go to the “story rooms” and try the VR maze, the Space squad and Lost City, an escape room. But en route there DnA ran into a Space Palette, a high-tech blend of music and art designed by a musician and software designer named Tim Thompson. The game involves thrusting your hands into different holes in what looks like a cross between a large easel and the old wooden stocks, and waving them around. Different holes and different speeds of waving produce whirling sounds and digital patterns that give you the sense you are composing sound and paintings with your hands. Thompson is one of several designers and companies who have partnered with the creators of the park. The hologram selfie, for example, was by a company called Vntana. The owners also created some of the attractions. Tim Thompson demonstrates his Space Palette, mixing tech, painting and music. Photo by Frances Anderton. The park is permanent, and will be open Monday through Friday from 4-11 p.m. and will open for longer hours Friday through Sunday. It's really aimed at all ages, and has full bar and restaurant. Entry is free but you pay for each game.